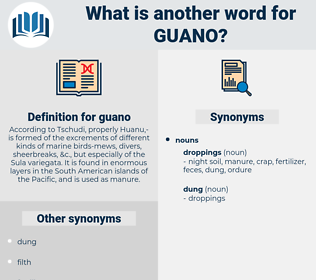 What is another word for guano? 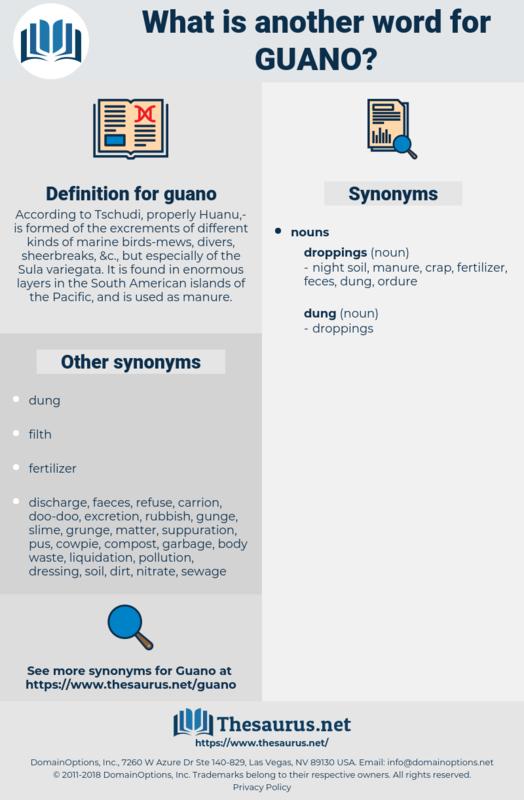 According to Tschudi, properly Huanu, -is formed of the excrements of different kinds of marine birds-mews, divers, sheerbreaks, &c., but especially of the Sula variegata. It is found in enormous layers in the South American islands of the Pacific, and is used as manure. Las Kuray exports gums, Dumbah sheep, and guano, the latter considered valuable, and sent to Makalla in Arabia, to manure the date plantations. For these materials England is at present dependent upon foreign countries, and the high price of guano and of bones prevents their general application, and in sufficient quantity. excreta, Organic Fertiliser, organic, excretion, organic fertilizer, body waste, excrement, excretory product.